Polystyrene food containers. Image via Getty Images. 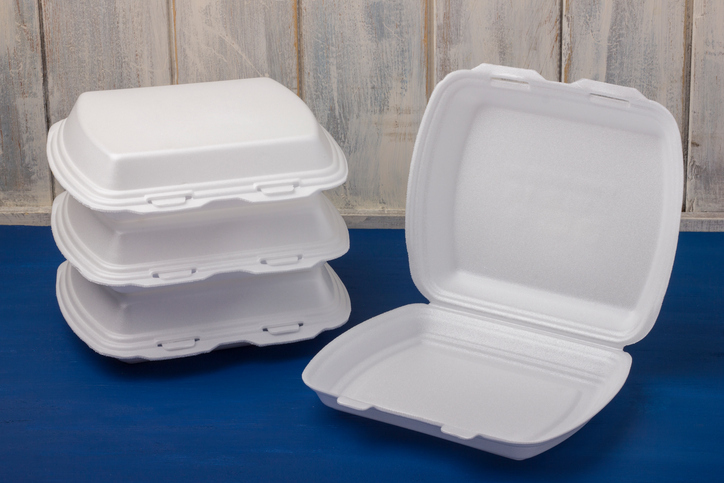 Local polystyrene bans continue sweep across U.S.
Cities across the country are taking a stand against polystyrene and banning the material from usage within their jurisdictions. Polystyrene is a foam polymer often better known by a trademarked version, Styrofoam. The polymer whose main ingredient, styrene, increases the risk of leukemia and lymphoma in humans, the Baltimore Sun reports. Additionally, polystyrene foam is littered more than any other waste product, the Sun continues. When littered, the material’s toxins can leak into the environment. Polystyrene doesn’t decompose, and its toxins make it a danger to flora, fauna and bodies of water. Over 100 cities have partially or completely banned the product within their jurisdictions, according to community solar power nonprofit Groundswell. That amount is continuing to grow — on Oct. 15, San Diego joined 119 other Californian cities with polystyrene bans after its council voted 5-3 to ban polystyrene food and drink containers, according to the San Diego Union-Tribune. Critics of the new rules say that the move would financially hurt small restaurants, the newspaper reports. The city included a measure for restaurants to obtain two-year waivers for financial hardship, as well as a one-year grace period for business that earn less than $500,000 per year. Critics also argued that due to the many mixed paper products used by restaurants, the ban wouldn’t give a major amount of relief to landfills. Smaller cities are pursuing such bans or similar single-use plastics bans, too. The East Hampton, N.Y., Town Board plans to introduce a bill to ban polystyrene use, while Sullivan’s Island, S.C.’s ban on single-use plastic products passed its first reading on Sept. 25, according to 27east.com and WCSC. A polystyrene ban that South Lake Tahoe, Calif. passed in April went into effect the week of Oct. 3, according to KOLO. Lambertville, N.J. passed a ban on plastic bags, straws and polystyrene earlier in September, according to NJ.com. The bill was advanced out of the state senate environmental committee on Sept. 27 following a 4-1 vote, according to NJ.com. “Until we get a statewide ban on plastics, Lambertville’s ordinance should be a model for other towns to reduce their plastic waste in New Jersey,” Jeff Tittel, director of the New Jersey Sierra Club, told NJ.com.